I’ve been practicing public relations for two decades. One of my first jobs as an intern was to program the fax machine in the City of Richmond Public Information Office for the daily newspaper, key weekly papers, the three television stations and the radio stations that had news departments. I had to fax content if you wanted it out quickly to all media. As I write this, I can’t remember the last timed I faxed something to a reporter. As reporter outreach goes online through email and social media, it’s important for public relations to embrace landing pages for announcements, causes, issues and even crises. Be sure your PR/communications department or your PR firm understands the importance of landing pages and how to use them. In this post, I offer my rationale for this change and some landing page templates you use. Today’s news release is still the most visible element of media relations, but it represents only a small portion of the information that you PR departments need to communicate. It’s nearly impossible to communicate everything in a news release or announcement. There are always other layers of information that can influence your target audience. Those are just a few examples off the top of my mind. Best of all, you can update the content as needed or as the issue evolves. This could include actual media coverage or more executive commentary. 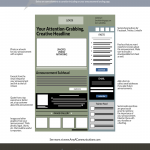 Landing pages are organic and don’t have the short shelf life of a news release. In today’s marketing, shareability on social media is a must. Landing pages are innately shareable through share buttons or by posting links to social media. What I like most is that you can share landing pages multiple times over a period of months. By contrast, a news release has a short shelf life that expires after a few days. You look a little crazy sharing a news release two weeks later, but it’s okay to share a landing page two weeks later as an “in case you missed it” post, especially if you have some updates. Landing pages also make great fodder for email and customer newsletters. I can easily see a landing page replacing the media kit or, at minimum, becoming the online version of the media kit. Reporters could access research reports, executive quotes, graphics, logos, etc. as material for their stories. It’s far better to put this material on a website than to include it with your initial pitch. Most importantly, reporters could link from their story to your landing page. That’s some SEO gold. Speaking of SEO, Google put the kibosh on news releases in 2013 because too many people were using them for SEO spam. A landing page, especially one that develops some authority, can live on forever and provide great SEO value to your website. PR pros have struggled over the years with measurability. I’ve been at it for 20 years and really can’t tell you the exact value of a news release or a news story. It’s fairly easy to roll these metrics into a nice report for your client, your boss or board along with the clip report that you create. You don’t have to master each skill, but you do need to understand how these pieces work together. Make sure your PR firm has the skills to help you execute landing pages as part of your overall PR strategy. The type of landing page you need depends on the goal of you PR project. For an announcement, your goals are probably the best media coverage possible as well as customer understanding. In this case, you want to provide easy access to the news release, photos, graphics, and facts that add detail to the announcement. Collecting email addresses is a secondary goal. For a cause or an issue, your goals are more likely engagement, involvement and understanding. In these cases, you likely want to collect email addresses or create ways for people to demonstrate their support. The first example is a landing page for announcement, such as a new product release or an acquisition. Click on the image below to see it full size. The headline is important as it is with a news release. The goal is sharing as much information about the announcement as possible. Make sure to include contact information in the top right to make it easy for reporters to contact you. Always incorporate social sharing and social proof to show the acceptance of your announcement. The second template is for community relations projects, causes and issues for which your PR department is managing communications. Click on the image for a full-sized image. Acquiring email address or getting people to join the cause is much more important. The email form has moved to the top left of the page. These pages could become very long. Consider adding navigation links at the top of the page to help visitors find information. Cause and issues lend themselves to hashtags. Make sure it is prominent on the page. Similarly, you want to emphasize social sharing by those who share your commitment. Add a call to action with social sharing. Ebooks from Copyblogger — Lots of great stuff in these ebooks. Make sure to check out the one about writing magnetic headlines. Unbounce’s blog — Unbounce are masters of landing pages. 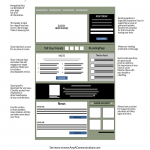 Anatomy of a Perfect Landing Page from KissMetrics — This is a great starting point for learning landing page design.